There are many study guides for Discover the Power Within You, Eric Butterworth's classic book that was endorsed by Oprah Winfrey, Norman Vincent Peale and Ira Progoff and has sold over 250,000 copies. But did you know that Eric Butterworth himself prepared a study guide? I don't know if it was ever published, but folder 34 in box 29 of the Eric Butterworth collection in the Unity Archives has a 36-page document entitled "Discover the Power Within You—A 12 Week Course for Unity Centers." Each of the twelve lessons covers one or more chapters; each lesson reveals supplemental reading from which Eric formulated his ideas; and each lesson lists significant concepts that Eric believed should be covered when reading the text. That is a study guide. But what makes this document far more than a study guide is the additional commentary that Eric provides for each lesson. The additional commentary reveals new insights into Eric's sources and thinking when he wrote Discover the Power Within You. This is fresh, heretofore unknown material from Unity's most successful author, directly illuminating Unity's most successful book. 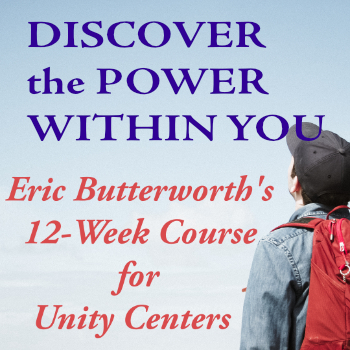 So here it is: Eric Butterworth's own Discover the Power Within You—A 12-Week Course for Unity Centers. You may download the PDF in the link below and you may read the study guide online by clicking on the links to the right (desktop) or below (mobile).